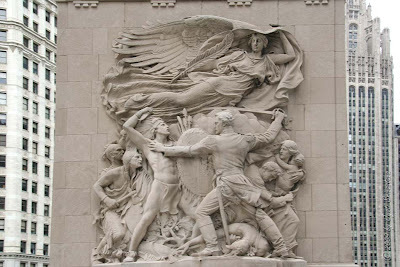 Defense, Regeneration, The Pioneers, and The Discoverers ..
- by James Earle Fraser and Henry Hering.. The Michigan Avenue bridge was originally conceived as a part of Daniel Burnham's 1909 Plan of Chicago. The double-decker double-leaf trunnion bascule bridge was designed by architect Edward H. Bennet and engineers Thomas D. Pihlseldt and Hugh Young, and opened in 1920. The bridge provided an impressive gateway to North Michigan Avenue and contributed to it's development as one of city's premier throughfares. 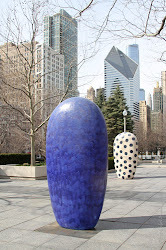 It was designated a Chicago Landmark in 1991. Each bridge tower is adorned with a bas relief sculpture commemorating important events in Chicago history. The Northwest and Southeast towers house equipment to operate the bridge. 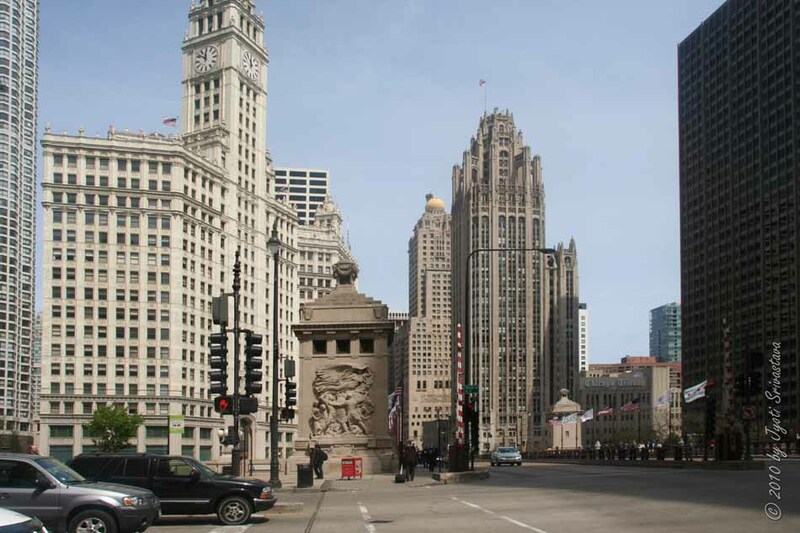 The McCormick Bridgehouse and Chicago River Museum is now located within the Southwest tower. Both of the south pylons are executed by Henry Hering and erected by the B.F. Ferguson Monument Fund. Both of the north pylons are executed James Earle Fraser and are gift of William Wrigley Jr.
"Defense - Fort Dearborn stood almost on this spot. After an heroic defense in eighteen hundred and twelve, the garrison together with women and children was forced to evacuate the fort. Led forth by Captain Wells, they were brutally massacred by the Indians. They will be cherished as martyrs in our early history. 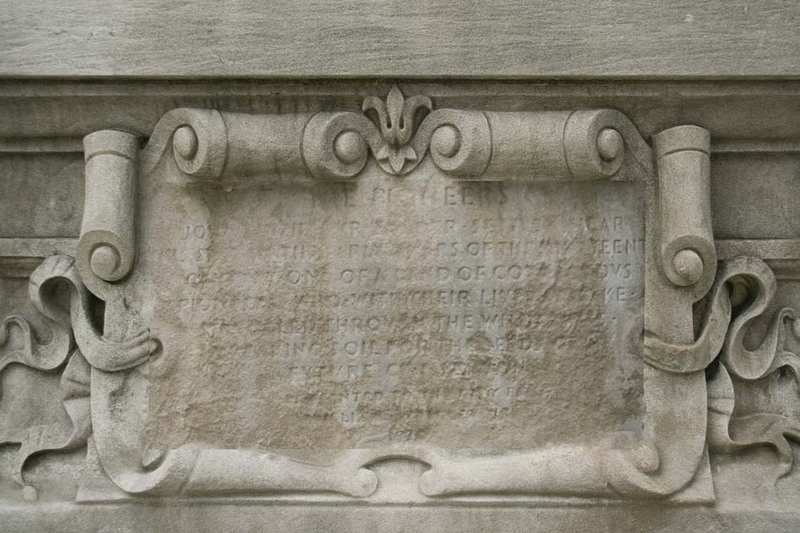 Erected by trustees of the B.F. Ferguson Monument Fund, 1928"..
Regeneration commemorated the Great Chicago Fire of 1871. 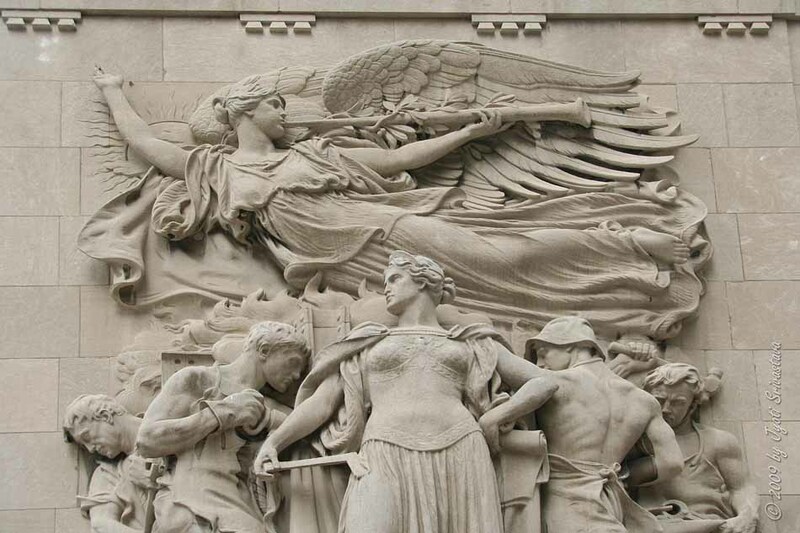 It portrays Chicagoans building the city upon the ashes of the fire. 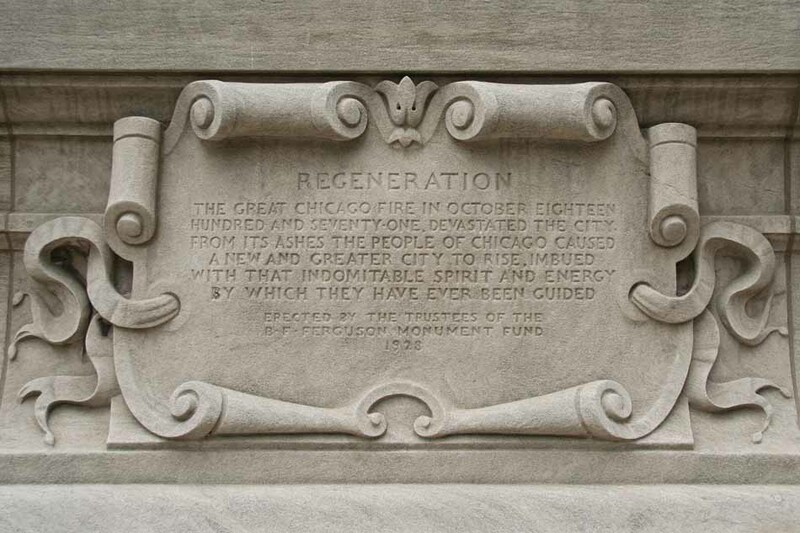 "Regeneration - The Great Chicago Fire in October eighteen hundred and seventy-one devastated the city. From its ashes the people of Chicago caused a new and greater city to rise imbued with that indomitable spirit and energy by which they have ever been guided. 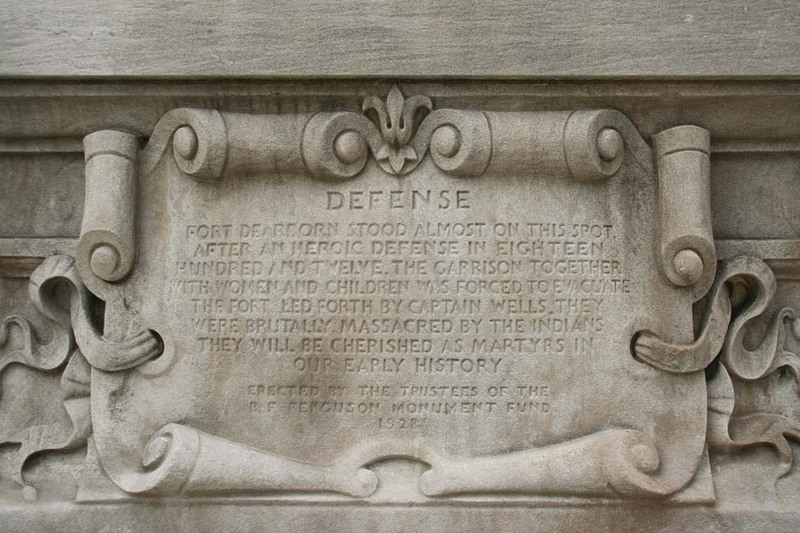 Erected by trustees of the B.F. Ferguson Monument Fund, 1928.."
The pioneers dramatize Chicago's earliest non-native settlers, John Baptiste Pointe DuSable and John Kinzie, who established fur trading posts near the mouth of Chicago River. 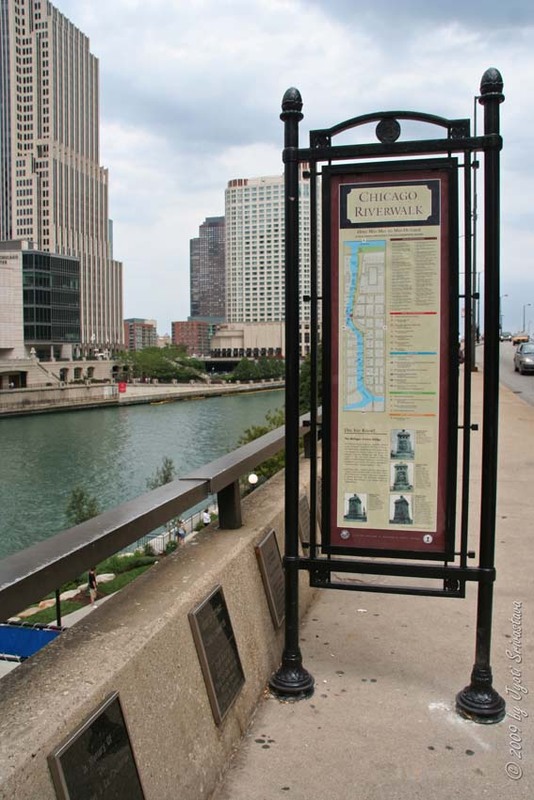 "The Pioneers - John Kinzie, fur trader, settled near this spot in the early years of the nineteenth century. One of a band of courageous pioneers - who with their lives at stake - struggled through the wilderness, breaking soil for the seeds of a future civilization. Presented to the city by William Wrigley Jr., 1928." 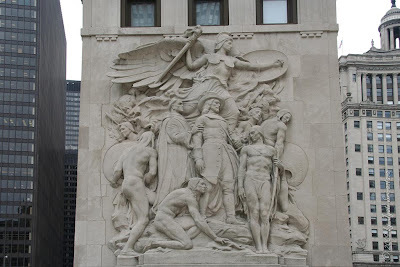 The discoverers commemorates four European explorers who passed through the Chicago area in the late 1600's. Louis Joliet and Father Jacques Marquette were the first non-native people known to explore the map of Mississippi River system. 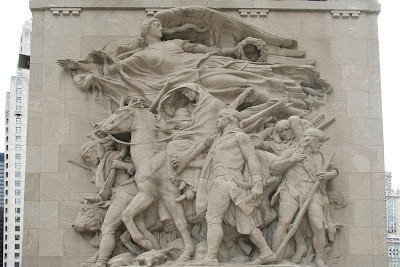 The traveled down the Chicago River in 1674 on their return to the Great Lakes from the Mississippi Rene Robert Cavelier, Sieur De LaSalle and Henri De Tonti explored the entire Mississippi River basin between 1679 and 1682. 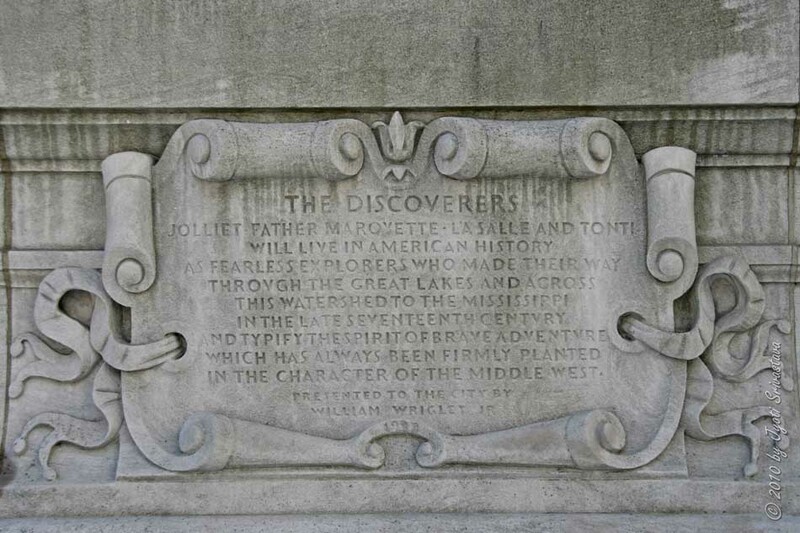 "The Discoverers - Jolliet, Father Marquette, La Salle, and Tonti will live in American history as fearless explorers who made their way through the Great Lakes and across this watershed to the Mississippi in the late seventeenth century and typify the spirit of brave adventure which has always been firmly planted in the character of the middle west. I am in shock that a public monument depicts European explorers in Chicago forcing indigenous slaves carrying their canoe. Yet a city with as many slave descendants as Chicago boastfully portray another form of slave history in public. Sad. Take it down! 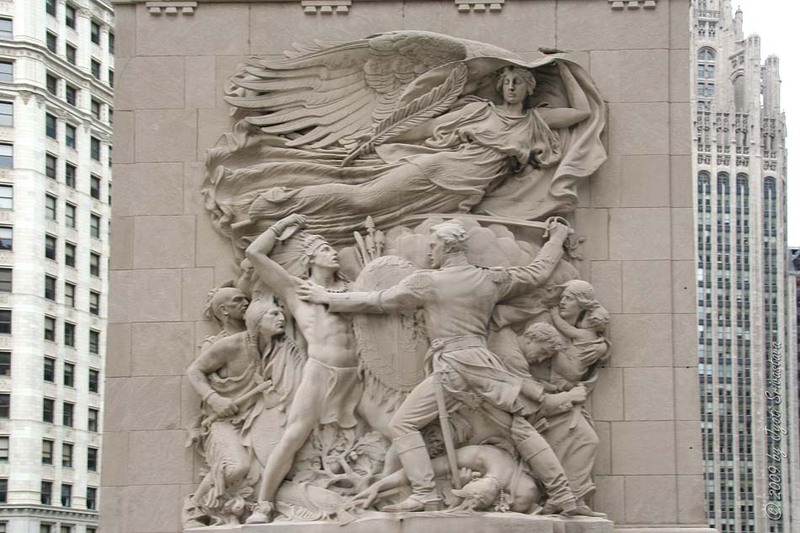 If there was a sculpture of a white man killing black people there would be a outcry. But since it's native Americans it's OK. It makes me sick . All the wrongs inflicted on native Americans ,and it's still happens is truly Sad. NARF forever! Little chicken turtle.